On the 13th Oct 2014, I was on holiday in Chicago to meet my old friend Ron. I stayed with him for some days and then we went to meet another old friend, Jake, in Viroqua, a small town nearby. Ron and I went to meet him to celebrate his 16th Birthday 16th and Halloween. We lived very well in Jake’s house, it was big and his room was full of gaming equipment. We nicely celebrated his birthday with a huge party given by him and his parents for his friends and family on the 24th Oct. We travelled to lots of places near Viroqua up to the 30th Oct., but due to some business meeting, his parents had to go to go out on 30th Oct to Chicago for 7 days, so we couldn’t celebrate Halloween so well. However, we decided to visit a cemetery for Halloween. 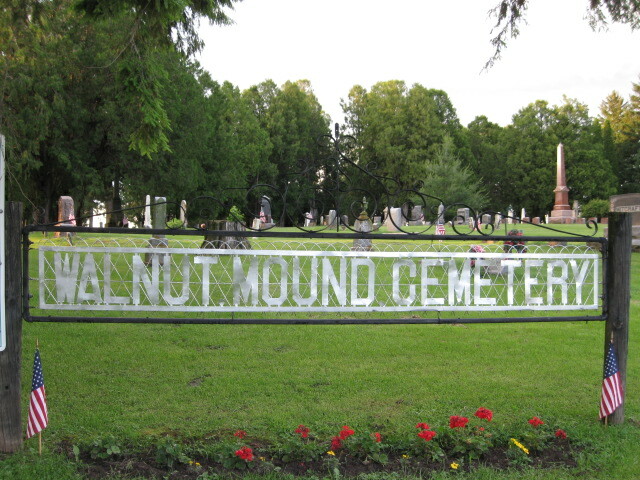 After sometime, we chose a Cemetery called Walnut Mound near Viroqua, that we saw it on our PC and we decided to go on the night of the 31st Oct.
That night, we reached Walnut Mound Cemetery in Retreat, Wisconsin at night – around 10 pm. We all got out of the car and entered the Cemetery and walked around to check for a tree which is situated in the center of the cemetery, which is said to be haunted and that, if you touch it, then the tree may shed all its leaves as it is possessed by a demon or evil spirit. We decided to give it a try and to also search for Francis Asbury Wallar’s grave stone – who was a great Civil War Soldier. All was fine until about 11 pm, but after that, we saw a bunch of fog starting to emerge. So we decided that it was time to find the tree. As we walked through the cemetery and reached the center of it, we suddenly heard the voice of a girl crying behind a tree in the center of cemetery. As we got closer to it, the crying stopped and although we searched all around the tree, there was no girl or anyone there. We thought that perhaps it was actually the sound of leaves being blown around due to breeze. When we looked at the tree, the wind blew so hard that we all had to lay on the ground. Then the wind stopped suddenly and we looked at each other in surprise as the tree had shed all of its leaves like the myth suggested it would! Jake was so scared that he was breathing very hard and he said he was going back to the car and would carry on with us later. I continued to search still in surprise about the tree and then we went to find the Wallar gravestone heading in a northerly direction. I saw one gravestone with 2 tiny gravestones in similar design by its side that took my interest and so I went over to it. I starting to look at them when I heard the sound of walking behind me and in fear, I looked behind me and there was a woman in 18 century clothing standing there looking at me. In surprise, I fell over a gravestone and hurt my back. Where the woman was standing, I saw that there were also 2 men in coats looking at me as if they are going to kill me. They were around 30m away and I started to run. As I started running, they appeared again in front of me blocking my path and I was so scared that I started to tremble and shake. I started running again without looking back and ran out of the cemetery and to the car in fear. I didn’t find Jake inside the car though, so I started to look for him and called his name, but there was no sign of him. As it turns out both Ron and Jake were in trouble just like me. When Jake was heading to the car, he fell into some bushes. There, out of the corner of his eye, he caught sight of a yellow light like a glowing bulb 50m away from him and he started to follow it out of curiosity. He soon lost sight of it however, but instead he saw a bald old man standing with a lamp in his hand looking right at him. He was so scared and began to run to try to find his way out of the cemetery. He met Ron on the way out. Well, we all jumped in the car and we drove away as fast as possible from the cemetery to his home. We reached Viroqua around 1 am and were tired and so slept at once and couldn’t speak to each other. The next day we all shared our stories and when Ron shared his we all felt strange and full of fear. He said when he found the Wallar’s grave and that there was another gravestone nearby from which smoke emerged and he got scared. Then he felt a spirit enter his body and he fell on the ground breathing hard as if somebody was holding his neck tightly with both the hands. He managed to stand and the spirit came out of his body, but he felt sick and feverish and ran away fast meeting Jake on the way out. So, there how was our experience in this Haunted Cemetery which we thought to be safe but no, it was the worst experience in our lives and we would never be going back there again never.